We were looking for an inexpensive place to stay for just one night on our way to FL. We have stayed here before and it was nice, but when I called to make a reservation I was told that the daily rate is now $30 for military, and $40 for the public. More than the FL state parks even with their reservation fee. I have been coming to this campground for the past five years and every year it gets a little worse. It seems that all the money is being spent on something other than upkeep.The entire time we were there one of the two cloth dryers was Out of Order and on the day we left I posted a note on the Facebook page and got a response from the Manager that he did not realize this was a problem and would get it fixed the next day.I do not understand how the USAF can let a beautiful piece of property like this go to H---. We stopped here for the first time as a staging stop on our way to the FMCA Rally in Perry. Even though, many of the previous comments were on the negative side, I don't let others influence whether we stop or not. It is our own judgment whether we STAY long or not. And, we happy to report that we not only stayed our full two weeks but we'll also be coming back next year. As to the "negative Nellies", just want to add, it's all about economics. If management hadn't opened up to public at higher prices and more nites stayed they'd have to have closed the facility. Then what would be said about that! For the two weeks we stayed, never saw the place totally full. So come on in an enjoy a very nice FAMCAMP that has all that your used to having. It's not far from the I-75, yet very quiet. FHU sites! good fishing that free if you're over 65! We were parked in space 32 in the open with great satellite sighting. The office also has ice cream, soda, beer and candy for sale. When we needed to do our clothes washing, the machines worked great, at $1 per load, dryers worked great at $1.25, too. Nick, in the office taught me, between other customers, how to fish this difficult lake. Nice park, clean well maintained, Monday thru fri very quiet, weekends more crowded but still very quiet.campground always had open spaces,wifi works.over the air tv is good,host is good helpful. we will see how memorial day weekend is,I expect a large party. Nice camp ground. Nice walking trail around the lake. Not on Moody AFB proper. Get off I75 at exit 5. 1.9 miles from exit to camp ground. Clean facilities. We heard from a few of the civilians and hand full of military retirees there. The military do not like this arrangement. I do not like being negative. But might as well tell you up front, I do not like civilians in military camp grounds. They didn't serve but sure want the benefits we all earned. So now for what we saw and how we feel (sorry): The civilians plan on staying. One told us "where else can I get a site for $450/month with all util paid. Wifi. Community house with TV and micro?" "I am staying." Other civilians expressed the same. The few military retirees that were there expressed their feelings about these civilians there: oppose it. 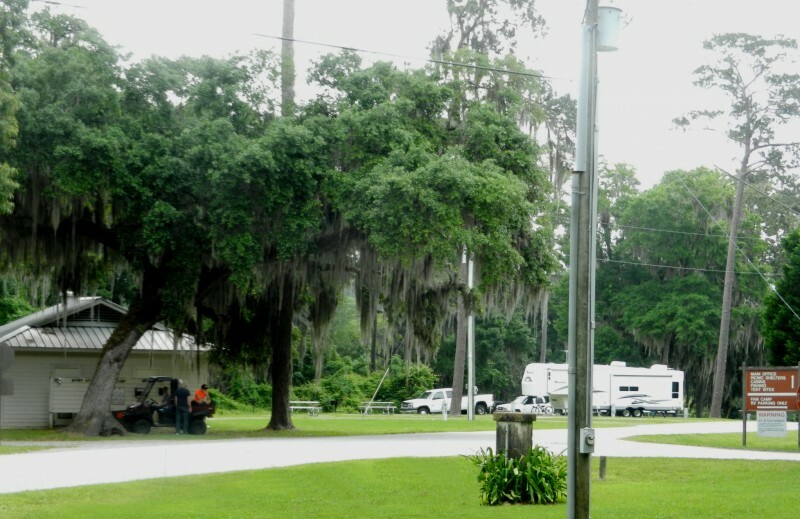 Just about two years ago the MWR kicked most of the retirees out of the campground. Now the door is wide open for civilians to long term stay. Yes, they can stay 90 days and move out for one day. The civilians we talked to told us they would go to a local Walmart for one night and come right back the next day. When this place is full of civilians and active/retired military cannot get a space -- how will MWR handle that? Don't think that will happen? Just listen to the attitude of the office people. They don't care. Goal is make the bucks. From hearing things at the office seems the people on the desk feel "well if they are paid up then we won't move them for a military person." Just great! There is a military camp ground in MN that let civilians in a few years ago. Military can no longer get in. We stopped there few years ago to check this out. Yep, could not get in. 100% full with civilians. Here we served. Honorable discharge. Retired. And a civilian who never served can keep us out? Something is wrong here folks. The office told us had to let them in or close the place. Then MWR needs to manage the place better. And free up some the funding that goes to the golf courses and O Clubs to help out the camp ground. We are sure by this coming summer (2016) the place will be jam packed with civilians homesteading. And military will not be able to get in. Who are these civilians MWR is letting stay long term at Grass Pond? We were told one is a ex-con and his girl friend is now in jail. We were told this by more than one military camper. THIS IS NOT CONFIRMED. Wow! Bottom line, do we need any of this type as our neighbor in a MILITARY FamCamp? This guy had/has guys over in his tiny trailer late at night. From what we were told, they sure didn't look like coming over for a BBQ and a beer type. Seems MWR does not know who is coming in and do not check on these people. These civilians, for the most of them, never served a day in uniform. They see a great deal and are moving in. We served with honor. and have to put up with this? One of the civilians is doing odd jobs around the camp ground. Wonder if he is even paying rent? Another civilian living in one of the cottages told us he is staying. He works at a local factory and is telling his co workers to come on out and live at GP. Another civilian told us he was here. Went to a civilian campground. Didn't like paying so much and not getting anything. So he is back to live long term. Another civilian plays camp ground host. She pays rent. Then the office give it back to her as "payment" for work. I thought this type of dealings were not authorized by AF Regulation? Seems the manager at GP found a way to say she is paying rent. If MWR cannot make a buck at Grassy Pond then close it down. We personally object to civilians coming in. Grassy Pond is a very nice rec area. Too bad it is about ready to go down the tubes with a flood of civilians. We were in the community room. In comes a civilian woman. She has a very nasty way about her. She brings her dog into the community center/laundry room. When asked to take the dog out she says "I am getting my home sprayed today for fleas and I don' leave my dog outside." Thanks lady for bringing your mutt and its fleas into the community room. NO respect here. She is one of the long term civilians who live here. She is in the end spot, one of the best spaces, on the other side of the road to the circle side. Way to go MWR. Thanks. ---- Added Jun, 2016: t66quin, thank you for your review. Sincerely hope you do follow up by sending your written comments to higher ups. Letting civilians in is a big mistake and a insult to active and retired personnel who have served. The civilians we spoke to there had a bad, very bad, attitude about military folks. Be it retired or active duty. This did not happen over night at GP. Good olde boy hand shaking has gone on at GP for years with the local civilians (no military connection). Management at GP knows this. They like being buddy buddy with the locals. Instead of taking care of those who are serving and have served! I would be surprised, very surprised, if ****** does anything but give mouth service. The civilians we personally spoke with do not belong at GP FamCamp. All of them had intentions of homesteading there. Taking advantage of the low rates. Few, if any of them, ever served a day in the military. IMHO I would fire the entire bunch who run GP and put some go getters in there who FAVOR the military and not the civilian community. It will take time but the military will come back. RI remember civilians (with no military connection what so ever) out there YEARS ago. So this didn't start yesterday. They kicked the military out few years ago. Nothing like group punishment. Instead of warning and going after the one or few who needed to go...they kicked the entire lot out. Now bunch of civilians are homesteading there. Some you don't want to know their back ground! The military customers out there will slowly go away. Then the place will be nothing more than your cheap Ga type of fishing hole camp ground. 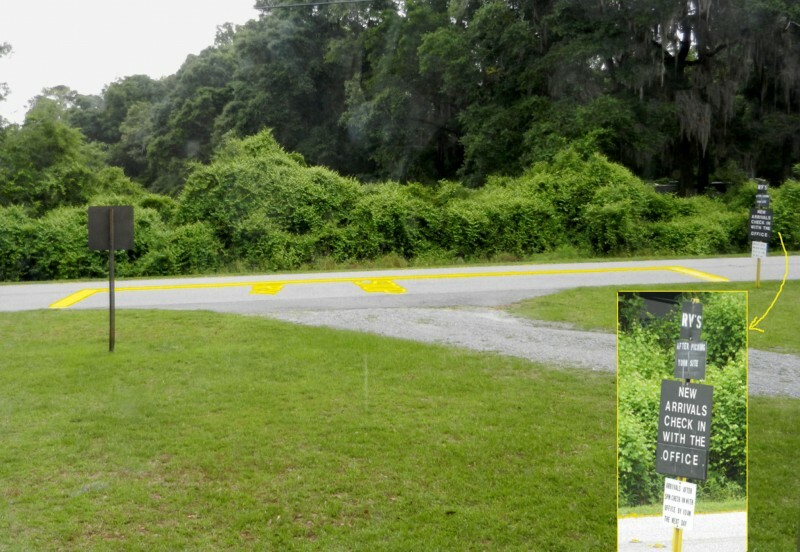 We spent three nights at Grassy Pond to break up the drive from Kings Bay Sub Base in St. Marys, GA to Blue Angel Naval Rec. 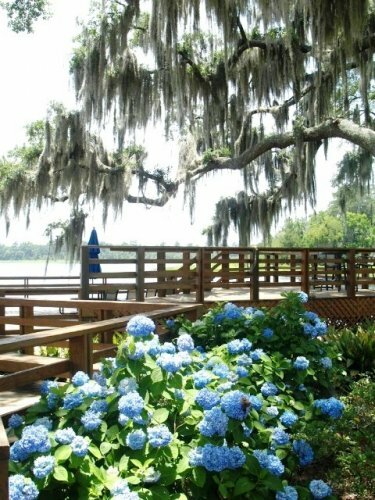 Area in Pensacola, FL. It was our first time to visit this campground. We loved the rustic setting. We had a spacious, shady pull-thru site with FHUs and 50 amps. Our phone, MiFi, and TV antenna (no satellite dish) worked well. The cable TV wasn't operable, our only minor complaint with this campground. The restrooms, laundry room, and activity room were spotless. Even on the weekend the CG was only 2/3 full. Half a dozen sites appear to be occupied by seasonal residents. The CG host was very helpful and friendly. He told us that the CG was losing money and that's why it was opened to the public in January. However, very few civilians have stayed overnight so far, even on weekends, although many locals like to fish on the lake just down the hill. We enjoyed walking with our dogs on four miles of mostly well-groomed, shaded hiking trails through the forest and wetlands around the two lakes and there were plenty of places for us to ride our bikes on nearby country roads and beautiful residential streets in Cypress Lakes Estates, Don't be deterred by the fact that this campground is now open to the public -- it's a very nice, rustic place to relax, fish, hike, etc. and quite convenient if you're headed north or south on I-75. SADLY I WILL LIKELY NOT RETURN. Stayed here for 4 nights while traveling to Florida. It is a BEAUTIFUL area but from what I am told I was lucky to not be there in mosquito season. The spanish moss was beautiful. The facilities are very nice and just a beautiful location. The camphost was awesome and more helpful than could be asked for at all times. 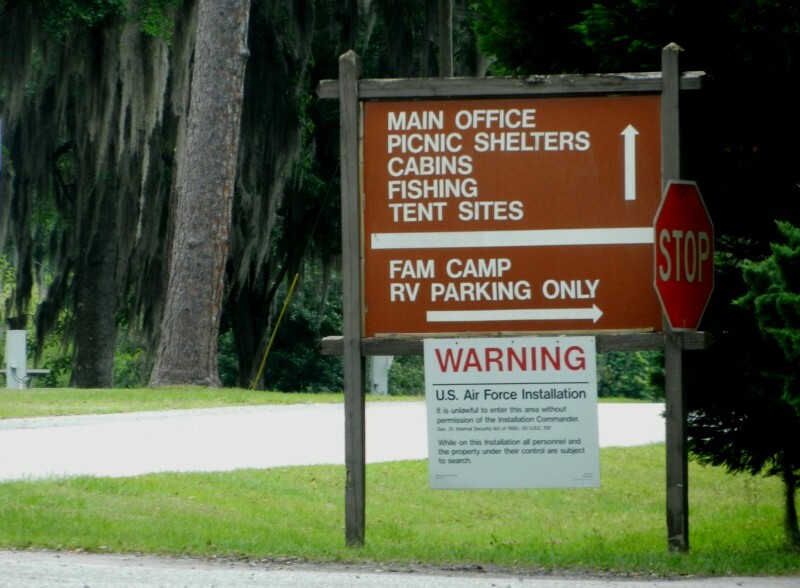 There is a downside, while speaking to the camp manager I was informed that beginning in January this camp will be opened to ALL civilians with no military DoD affiliation required. This was a disturbing fact to myself and the other campers I spoke with. 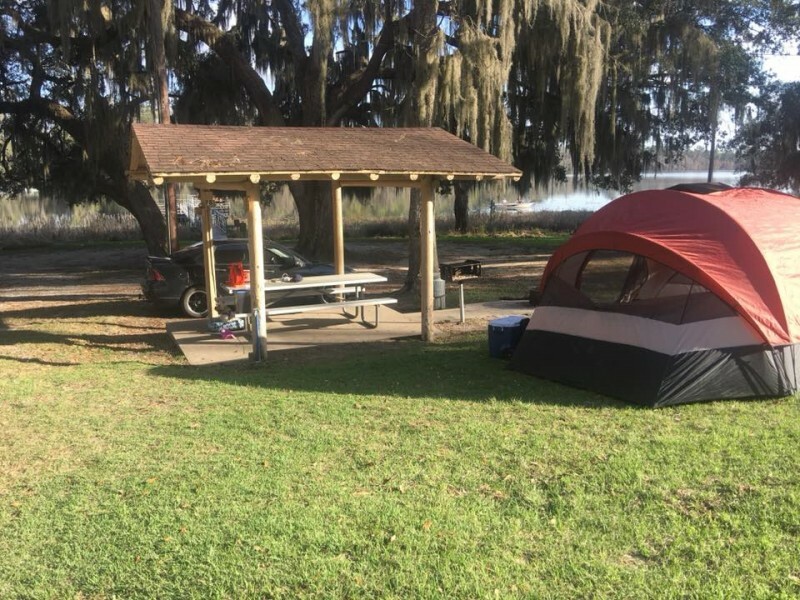 The campground is making a profit but apparently the powers that be decided a LARGER profit could be made by opening to the general public. Due to this fact that is why I started with I will not return. Most of the other campers I spoke with also claimed that even though they had been coming here for years they also doubt they will return. 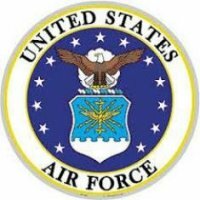 The campground is about 25 miles from Moody AFB. I hope this is a one off decision but it may just become the start of ruining military locations not located on bases. It appears to be that MWR has lost its way on what their mission is - to work for and support the military. This change eliminates the WHY active duty and retirees choose military facilities. I explored the entire facility and had a very enjoyable stay. Pulled in early evening. The place was completely silent, barely anyone around. A few campers around a few sites. Nice place. A good spot between Charleston SC and Pensacola FL. This is our first experience work an rv we purchased recently. We live near Moody afb so figured close would be great in case we forget something. Easy access and hook up, lots of shade, feels private,nice laundry ($1 wash & $1.25 dry)/shower/community room facility. Fishing pond with boat rentals. The office closes at 5pm so if you come in later there is a sign when you drive in to just pick a spot and check in at the office by 10 am the next morning. We stay here every time we head to Florida as it is a perfect place to stop & break up the trip for us. So easy from I-75. Beautiful setting. We knew we were going to get there after the office closed so had asked which spaces would be ours. Don't bother. They told us which space but when we were driving in toward the space it was taken! Luckily for us, one of the maintenance guys pulled up right by us & explained that there really aren't reservations, but there were 2 other pullthrus open. Whew! We were able to grab one of the pullthrus & settle in. There is a lot to do here & we want to come back to enjoy this park & all it has to offer. This has to be the easiest setup we have ever experienced in our rig. Directions listed above are perfect. We drove up, turned into the driveway, drove about four spaces in, and found that site #16 (as many others) had an ENORMOUS drive through with concrete patio and full hookups. Drove in, left toad attached, and we were even pointed in the right direction to drive out. Check in was fast and efficient, great $20 rate, too. Would definitely recommend.